Cover via AmazonI was on a train for six hours this past weekend, with a book (the physical thing) on hand. 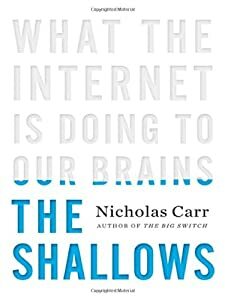 It happened to be The Shallows: What the Internet is Doing to our Brains, by Nicholas Carr. I can't say that I was doing deep reading because I'm not a regular train traveler and I was slightly distracted by the noise and motion of the train, but sitting in the quiet car, I did manage to read uninterrupted for significant chunks of time. While I was testing my ability to read (as opposed to the constant skimming and scanning that I and apparently everyone does on the web), my teenage daughter sitting nearby was doing her usual multitasking: math homework while watching a TV show on Netflix. My own brain cannot do that and does not want to try to do that. It feels fragmented enough, thank you very much. I can understand listening to background music while studying but I cannot understand watching TV while studying. But then, why should I worry about how she does her homework if her report card is consistently excellent? Since I was taking my daughter to visit my Alma Mater, I was also being reminded of the old days when 90% of my time was spent studying -- which in my days meant reading on my own, digesting content on my own, and taking exams on my own. I might have made every effort possible to avoid classes known to require group work. Did that make me incapable of working with other people today? I don't think so. Did that make me selfish? I don't think so. I don't necessarily buy into everything Nicholas Carr says in The Shallows, but I understand what he is saying about our brains' plasticity and how the tools we use reshape the neural pathways in our brain. I experienced it first hand with language. When I was 17, my family moved to the US (from France) and I soon enrolled in college in the US. My English was far from perfect at the time and I struggle for a while, but within a couple of years of immersion and constant reading in English (while essentially stopping to read or speak in French), my brain was rewired. I lost my fluency in French and my primary mode of thought and expression became English. When you stop using a skill, you lose it. It worries me that I may be losing my ability to engage in deep reading. I've already essentially switched to audiobooks for fiction. That was for convenience, since the only time I have for fiction is my car commute. Yet I realize that reading a novel while holding the book in my hands is not the same as listening to a well trained audiobook narrator while driving. Hopefully, I am not listening so deeply that my attention is diverted from my driving. With a book in hand, I can read as deeply as I want to. All this rambling to explain why -- for this week at least -- I will not try to engage in the PLENK discussions, I will focus on the readings and the readings only (well, after this post anyway), returning to my selfish individual learning habits, as a sort of experiment. I will reward myself with some deep reading and hopefully deep thinking.